Happy Mardi Gras to everyone! 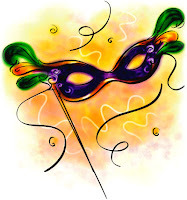 As many people know, Mardi Gras marks the last day of festivities before Ash Wednesday, which signifies the beginning of Lent. Lent is a time of prayer and fasting and self-reflection for us Catholics. We're usually called upon during this time to give something up, as self-denial is good for us. This year, I'm giving up several things for Lent. One of them is cursing. You may laugh, but this will be quite a hardship for me. I started cursing a lot when I first became a lawyer. Something about the high-pressure work environment just brings out the worst in me. This morning my %$#@ alarm didn't go off, but the %$#& construction next door to me was so ^%$* loud that I woke up at &$#!% 7 a.m. anyway. Then the &%$# subway was running late, making me 15 ^%$ minutes late for a &$#% meeting my *&%^#*% boss had called out of the blue without %$#%#& telling me about it. Then after another 3 hours spent calling #%^&# clients, I finally got to go home, but I just missed a (&^#!% subway and had to walk home in the @$&! !# rain and &^% 20 degree weather. What the ^$#@*? Today I had one of those days at work where someone I was pretty friendly with (and thought was my friend) said something so incredibly mean to me, randomly out of the blue, that my head spun and I did a double take. Women shouldn't be hating on each other in the office. We have enough to deal with in the workplace without trying to pull each other down. All I can tell myself is that I should give this person the benefit of the doubt. Maybe she was having a bad day, or woke up on the wrong side of the bed, or had a fight with her boyfriend, or is stressed out because her job is in danger and she may get laid off at any minute. Maybe she's jealous because I'm doing well and will be up for partner sooner than she will, and I like the partners and clients I work for whereas she works for a real troll, and the stress is just getting to her. Maybe she has been feeling under the weather, and this yo-yo hot/cold/hot February climate has gotten to her one too many days. But maybe, just maybe, it turns out she's not that nice of a person after all. And rather than fret about what someone as insignificant as she is thinks of me, I should channel my energies into cultivating relationships with my real friends. It's true..but it's always easier said than done, isn't it? Yesterday I closed my Citibank checking account. Citibank (or "ShittyBank," as some call it) has notoriously bad customer service. I always kept this account by rationalizing that it would be useful to have when traveling internationally. But in this day of ubiquitous ATMs and American Express, it's just not true anymore. I got tired of seeing other customers abused (I once saw a customer in line complain to a branch manager about a rude teller, and the manager yelled at the customer). Of the long lines reminiscent of the DMV or the Post Office. Of the dirty and gross branches (the one near me is populated by stray dogs who like to leave pee on its floors). Of the arbitrary and capricious fees ($7.50 per month just because I don't do direct deposit). After I walked out of the bank yesterday no longer a ShittyBank customer, it all felt surreal. I've had this account since I moved to NYC, nearly 10 years ago. It's always been part of my life here, until now. Over the weekend I went to a surprise birthday party. The party was for one of my guy friends. His girlfriend had emailed a whole bunch of people a few days earlier to invite us all. She instructed us to show up at this restaurant downtown around 6:45 p.m., and she would bring him there at 7 p.m. and we'd all yell "Surprise!" when they came in. Great. So I took the subway down to the restaurant, and was the first to arrive at 6:45. Since nobody else was there, I sat at the bar and had a drink while I waited. 30 minutes later, I was still the only person there. Um. At 7:30, my friend and his girlfriend walked in. They were half an hour late, but still earlier than all of their other friends. "SURPRISE!!" I yelled, as loudly as I could. I jumped around and tried to give the illusion of lots of people there, but it was an uphill battle. I just got back from a business trip to Our Nation's Capital. While there, I took the opportunity to visit the Senate Chamber of the U.S. Capitol and watch the Senators vote on a bill. Wow! We were so close we could see their facial expressions, watch them schmooze each other, etc. I kept thinking, "Wow, John McCain and John Kerry both look exactly like they look on tv!" I also caught a glimpse of both of my Senators. I also saw the Senate staffers sitting behind the Senators' podiums, along a wall. I noticed that the Democratic staffers sat along one wall, and the Republicans along another wall. There was some glaring and chest-beating. Afterwards, I walked around the Capitol building and read about the history of the United States Congress, and saw the U.S. flag and felt my chest swell up with pride and acknowledgment of the history I was witnessing. It was a very Jimmy Stewart day. It's been really cold here for the past couple of days. It's been particularly tough for me, having just come back from my fabulous South American summer vacation. On top of that, many law firms have been laying off attorneys, to an extent that's unheard of in history. I have several friends who have lost their jobs, and needless to say, the stress level has been higher than usual all over the City. I've been cooped up indoors, shivering and doing work, keeping my nose to the grindstone. So maybe it's caused me to start hallucinating during my commute, the only few minutes each day I can be outside? I have two pieces of evidence that my mind is playing tricks on me. So the lighting is such that it's hard to see in the photo, but if you can't tell, both signals are lit at the same time!! I wasn't sure whether to cross the street or wait! My head almost exploded from the uncertainty. SECOND, on my way home tonight, I saw a guy commuting home, dressed in a nice business suit, clutching a fancy leather briefcase, and riding a unicycle. Last Friday I was on my way back to the office from lunch with another female coworker. We were on the elevator going up to our floor. Sharing the elevator with us were two men who appeared to be in their early 20s. Both wore matching uniforms indicating that they worked for the same delivery company. One pulled a cart with packages on it. He was talking to the other about his plans for the weekend. "Yeah, it's my five year anniversary with my girlfriend," he said. "Wow," said the other one. "So are you going to do something special for her? Get her a present or something?" "Nah," replied the first one. "It was her birthday 2 weeks ago, and I took her out to dinner for that. So I figure it's ok. I don't have to do anything else." My coworker and I looked at each other and busted out laughing. The elevator came to a stop on our floor, and we walked off, still laughing loudly. We tried to stifle our laughs, but we couldn't. As we looked back and saw the elevator doors close behind us, the last thing we saw were the two guys' puzzled faces. "Yeah, he's going to be single after this weekend," said my coworker.